My iHerb order arrived this morning! Mine arrived today - the marshmallow treats are nice! Where can I pick up a solid deodorant in the UK? I've tried a few some rubbish and some rather expensive. Any suggestions? By the way there's a UK website called Fashion Conscience which sells vegan shoes and boots but I would very much suggest people be careful about buying from them based on my experience. I was really excited about it and bought some expensive vegan boots costing over £115 (Novacas brand) but didn't really like them when they arrived. I returned them immediately unworn. But after two weeks hadn't got a refund and e-mailed them. But no response. Then I tried to call them. And could not get through to their customer service no matter when I called. They just don't pick up the phone ever.Then I e-mailed again a few times and no response. It's more than a month ago now and I still haven't got a refund and just can't get in contact with them. I've written them a letter and attached proof of postage so am crossing my fingers I get my money back. They are an active company, always posting on their Facebook page and sending general e-mails about new products. I posted on their Facebook page giving my order number and just asking nicely for them to please give me my money back but they just deleted my post. When I did a google search to see if anyone else had experienced problems with refunds and customer service there are several people saying the same thing over the last few years! I know I shouldn't have spent that much money on boots. I would have kept the boots if I had known I would be that much money out of pocket without knowing if I'll ever get it back. So just beware. Hope no other vegans have the same problem I have had as it's not fair practice and I've never had this problem before buying online. Hi Dee dee. I hadn't heard of them but if you paid by credit card or Paypal I would think you could get your money back through the payment company, if all else fails. Tofu_lew, there is Mitchum deodorant which some people seem to think is vegan although I haven't investigated. You can buy that in larger branches of Superdrug, don't know about online. It seems to be a personal thing - some people like those crystals which they sell in health food shops but they don't really work for me. Superdrug have a rollon one which is actually marked vegan but you want a solid one. Thanks Harpy, I'm going to try credit card chargeback if I hear nothing but it takes months apparently and you're still not guaranteed to get your money back. After that the small claims court because it is a lot of money but I really hope it doesn't get that far. Just so surprised at this as even if they responded with a reply apologising or giving me any feedback about the refund I wouldn't have minded a delay if they have had problems. But they just don't respond at all to anything. And I feel protective about other vegans having the same experience as me as it's miserable and stressful losing that much money. Shame they sell vegan stuff! Last edited by harpy; Mar 6th, 2012 at 07:14 PM. Just for info: I got my money back from Fashion Conscience! I posted above about having real problems with them not giving me my money back after I returned a pair of unworn boots I had ordered from them. And they didn't respond at all to e-mails, didn't answer the phone, deleted my polite Facebook posts, and ignored my letter. But my friend took up my cause at the Brighton VegFest (bless him!) and politely bothered them about it face-to-face because he was so annoyed for me. And they did agree to give me my money back in the end. I am so relieved. So I really really hope this company doesn't do this again to anyone else. They just need to look after their customers in the normal way. That would be lovely! My friend has just sent me a link to order from vitacost. As far as I understand, they give $10 discount for the first order. Have any of you tried to order from here? Also, if any of you know any other stores that ship to Japan at affordable rates - please let me know. 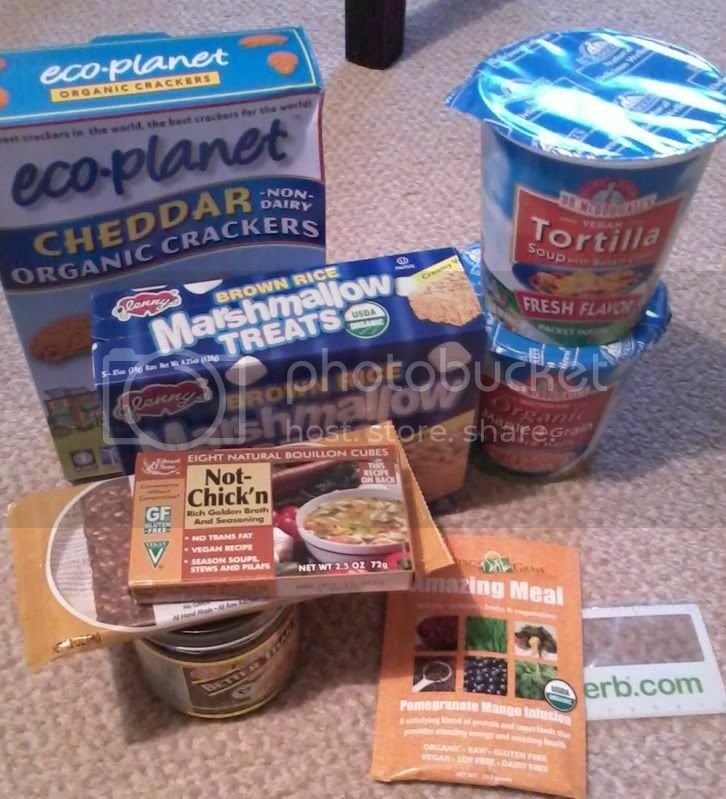 I always order from iHerb, but I would also like to find some other online stores, as iHerb does not ship certain food items to Japan. Glad you got your money back eventually! Did they tell your friend why they'd behaved so badly though? Well done, Dee dee's friend! OK, so now I have placed my very first order. It seems postage to the States is only $4.99, but to Japan it is is $10.99 for 1.35kg. But still it was quite a good deal with $10 discount. Hope the vegan goodies I have ordered will reach me soon. Just for info: I got my money back from Fashion Conscience! Well done! + It's good you posted about them here. They do not seem to be trustworthy. Thanks Twinkle, Mija and Harpy! Yes my friend is a vegan hero. The director of Fashion Conscience told my friend she didn't know anything about it and it was a mistake (even though my polite Facebook posts were deliberately deleted!) but as a last resort anyway I had sent a letter directly to her giving all the details and asking for the refund. And she had signed for this letter because I paid for special signed-for delivery so could see she had received it! So not sure how she didn't think she knew anything about it. I just think it's a small company that is not caring enough or being co-ordinated enough in making sure it does the right thing by its customers on customer service and returns. Making money perhaps more important. But very short-sighted in the long-run! Shame as they sell nice stuff! But won't be buying from them ever again. Sorry to hear about your problems Firestorm. Complain, complain, complain! Thank you so much for the link! I have just received my first order from them Very happy about $10 discount that the link provided Postage for three pounds is really good value. I love that place, cutest shirts around. www.planetavegano.com a vegan store in Madrid Spain. Sausages, cheeses, vegan egg!, vegan pet food, burguers, shoes, books, t-shirts, vitamins, ice cream, chocolate and more. I don't think you'll find one that doesn't charge a fortune for chilled/frozen deliveries. Shame you missed it as a few days ago Redwoods did free delivery for 24 hours to celebrate their new website. It's a bit cheeky but perhaps if you went on their facebook page and added a comment about how disappointed you are that you missed it maybe they'll take sympathy on you. Other than that, all I can think of is you try and convince a local store to get stuff in for you, we did that and now they get in pretty much anything we want and sell loads of vegan stuff. Even a Holland & Barrett might be able to help. Thank you both for the replies All sounds good! I just found an online shop called Anandas (they make the marshmallows) and they sell vegan condensed milk! Condensed milk is something I haven't missed in 20-odd years, but now of course I realise I need some I seem to remember you had to boil it in the tin for banoffee pie, with occasionally explosive results - wonder if this requires similar treatment? with occasionally explosive results - wonder if this requires similar treatment? Oh dear, if I get some I will try and avoid that! Hi, its my first post so Im not sure where to put this but I've been searching for 'nice looking' womens, non-leather long boots for ages and I thought this might be some help to the other forum users. I really like our local shop in Cheadle who usually sell leather shoes but recently I've bought a few pairs of really good quality synthetic boots that don't hurt your feet and aren't the plastic rubbish you get at Deichmann etc. The brand is called Marco Tozzi I think its italian or something. The website is called www.westwoodsfootwear.co.uk but theres lots of other places selling them on line too.